Independent researcher, Curitiba, PR, Brazil. Earlier this year, an article entitled “Which is The Most Offensively Powerful Starter Pokémon?” (Codd, 2016) caused great controversy on the Internet among players and fans of the Pokémon franchise. This article compared the three classical starter Pokémon, based on the anime, and concluded that Charizard was the strongest one. The present work aims to analyze and discuss the data presented by Codd (2016) regarding the following issues: (1) Does his anime-based data coincide with the game mechanics? (2) Can his study be applied to metagame prospects? (3) Is Charizard really the most “powerful” Pokémon in-game? Pokémon™ is an entertainment franchise, created by Satoshi Tajiri in 1995, that started with video games, but now includes an anime, a trading card game, clothing and several other products. Needless to say, the main products of the franchise (the games and anime) caused a large impact in recent pop culture. The first products to be released were the “twin games” Pokémon Red and Pokémon Green, in 1996 in Japan. These games were later (in 1998) released worldwide as the Red and Blue versions for Nintendo’s Game Boy console. (As a side note, in celebration of its 20 years of existence, earlier this year the Pokémon Company released a website containing a timeline of their products). On TV, Pokémon was first released in Japan in 1997 with the episode “Pokémon – I Choose You” (released in the United States only in 1998; Wikipedia, 2016), triggering wide public attention. The franchise is now successful worldwide, attracting millions of fans and players of all ages, ethnic groups and social classes, and the games are often regarded extremely seriously by the players. Codd (2016) concluded in his article that Charizard (the last form of the starter Charmander) was the most powerful of the three initial options (the grass-type Bulbasaur, the fire-type Charmander and the water-type Squirtle; Fig. 1). 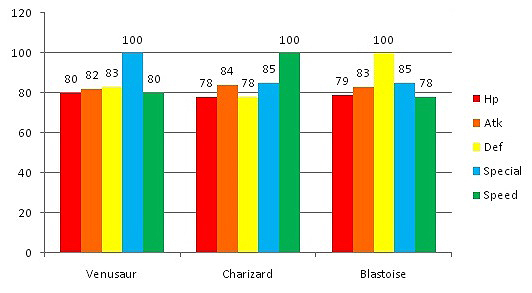 To reach this conclusion, Codd based his work on “data” provided by the anime, specifically (for Charizard) in the episode “Can’t beat the heat!” (aired 17/Feb/2002), from which he estimated variables such as weight (body mass), height and width of the Pokémon. Through a series of calculations, all very well-founded in Physics, Codd determined that the offensive power of Charizard is well ahead of its competitors. In the games, Pokémon are defined by certain features, among which are the above-mentioned Stats. Each Pokémon has a given number of points assigned differently to its Stats, making it tough, agile or strong. HP represents the Health Points (or Hit Points) of a Pokémon, and from the work of Codd (2016), it is understood that a Pokémon that is “powerful” is the one with the highest chances to take the opponent’s HP down to 0 more effectively. Thus, to estimate how powerful a Pokémon is, one should not base his/her calculations on features estimated from the anime, but rather analyze the Stats distribution of a given Pokémon as it appears in the game. This study takes into account the Stats of each of the starting Pokémon to more thoroughly analyze how powerful each can become, that is, how much damage a Pokémon can cause in a battle. Let’s first set the game to be any of the so-called “Gen I” versions (Pokémon Red, Blue, Green or Yellow), released between 1996 and 1998. In these versions of the game, there were less Stats, only: HP, Attack, Defense, Special and Speed (also, there were no mega-evolutions). The distribution of stats between the starting Pokémon (in their last form) can be seen in Figure 1. Figure 1. Base stats of (from top to bottom) Venusaur, Charizard and Blastoise in Gen I. Source of the tables: Serebii.net. Original artwork of the Pokémon by Ken Sugimori; available through Bulbapedia. 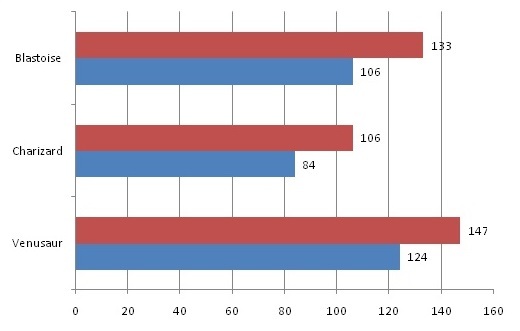 By comparing the so-called Base Stats of the three starting Pokémon (from Fig. 1), we get the chart shown in Figure 2. This gives us a broader view of the Stats distribution of each Pokémon, distinguishing their higher and lower attributes. If we add up all the Base Stats of each Pokémon, we obtain a grand total score of Stats points (Fig. 3). 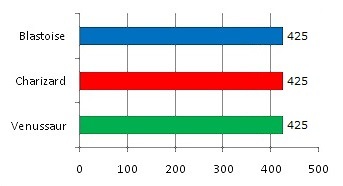 From Figure 3, it can be seen that all three Pokémon sum up to the same value: 425 points. In the first versions of the games the Stats were kept in a balance during the development of these three Pokémon. Thus, the sum of Base Stats alone is not enough to show which starter is the strongest. There’s more to consider. Figure 2. Chart comparing the Base Stats of the three starters in Gen I. Figure 3. Sum of all Base Stats values of each starter Pokémon in its final form (Gen I). where “Level” is the current character level of the attacking Pokémon, ranging between 1 and 100; “AttackStat” is the Base Attack Stat or Special Stat (depending on the kind of move, Physical or Special, used) of the attacking Pokémon; “DefenseStat” is the Base Defense Stat or Special Stat (again, depending on the kind of move used) of the opponent; “AttackPower” is the power of the move used (this is pre-defined in the game and each move has its own power value), where a greater value represents a greater damage output; “STAB” is an acronym for “Same-Type Attack Bonus”, which means that if the move used has the same type as that of the Pokémon using it, it increases in 50% (STAB = 1.5; otherwise, STAB = 1); “Weakness” is applied depending on whether the chosen move is super effective on the opponent (this variable can assume values of 0.25, 0.5, 1, 2 or 4, depending on the type of the move and of the defending Pokémon); “RandomNumber” is simply an integer assigned randomly by the game, ranging from 85 to 100. Other in-game factors may cause changes in damage output, for example: weather effects (rain and sunshine), and the so-called “buffs” and “de-buffs”, which are respectively temporary increases and decreases in the Pokémon’s Stats caused by moves such as Agility, Dragon Dance, Swords Dance etc. Weather effects were not yet present in the first versions of the game, so they will not be considered in this study. Moreover, to keep the analysis simple (not to say feasible), increases/decreases in Stats will also not be taken into account. The calculations here use only the Base Stats of the Pokémon in question and the set Power value of the moves. Weakness will also not be applied. Codd (2016) considered the “signature moves” of the starting Pokémon as: Solar Beam for Venusaur (grass type), Flamethrower for Charizard (fire type), and Hydro Pump for Blastoise (water type). The Power of each of these moves can be seen in Figure 4, alongside other data: “Battle Type” is the type of the moves, which in this case are the same as the types of the starter Pokémon (so STAB = 1.5); “Category” refers to whether the move is a Physical Attack or a Special Attack (all are Special and thus use the Base Special Stat); “Power Points” (PP) represent the number of times that the move can be used; “Power Base” is the Power of the move (used in the equation above); “Accuracy” refers to the probability of success in hitting the opponent (in %). Figure 4. From top to bottom, the moves Solar Beam (formerly rendered as “Solarbeam” or “SolarBeam”), Flamethrower and Hydro Pump, showing their in-game Power values and type (in Gen I). The symbol in the “Category” entry means that the moves are all Special Attacks. Source: Serebii.net. To calculate the damage dealt by each of the starter Pokémon with their signature moves, I used a virtual calculator available at Smogon University, the “Pokémon Showdown”. (Smogon University is a community dedicated to the competitive world of Pokémon games, giving the players some useful tools.) The moves have the Power values shown in Figure 4 and the defending Pokémon will be a Chansey (see Fig. 5 for Base Stats), which is neutral (that means, neither weak nor strong) towards the starters and their signature moves. All Pokémon are considered to be Level 100. Figure 5. Base stats of Chansey in Gen I. Source of the table: Serebii.net. Original artwork of the Pokémon by Ken Sugimori; available through Bulbapedia. Venusaur (Solar Beam): Note that the Gen I version of Solar Beam is not present in the Pokémon Showdown database, so I used the Gen II version instead (the Power is the same). The damage output falls in the interval 125 to 147 points, which represents 17 to 20% of Chansey’s total HP. Venusaur needs to land 5 blows to knock out its target. Charizard (Flamethrower): The damage output falls in the interval 90 to 106 points, which represents 12 to 15% of Chansey’s total HP. Charizard needs to land 7 blows to knock out its target. Blastoise (Hydro Pump): The damage output falls in the interval 113 to 133 points, which represents 16 to 18% of Chansey’s total HP. Blastoise needs to land 6 blows to knock out its target. Just in case, these numbers were checked on another calculator, built by myself (Pokémon Damage Calculator; Carli, 2016). An algorithm was developed based on the damage equation from above, translated in some programming languages (available at: https://github.com/brunolcarli/pokeDamageCalc) and then translated into APK format so it can be installed on any mobile device running on Android (Fig. 6) or Windows operating systems. Feel free to download the app at: https://build.phonegap.com/apps/1824036/install. The results were very similar (Fig. 6): 127 to 144 points of damage for Venusaur’s Solar Beam; 84 to 98 points of damage for Charizard’s Flamethrower; and 106 to 122 points of damage for Blastoise’s Hydro Pump. Figure 6. 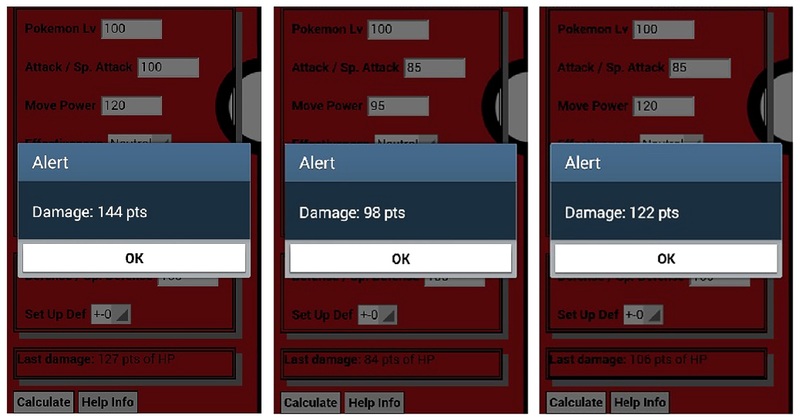 Screenshots of the Pokémon Damage Calculator app (Carli, 2016: v. 1.0.0, running on Android OS), showing the maximum damage output for Venusaur’s Solar Beam (left), Charizard’s Flamethrower (middle) and Blastoise’s Hydro Pump (right). Organizing all these numbers (from both the Pokémon Showdown and the Pokémon Damage Calculator) in a chart (Fig. 7), it is possible to clearly see the minimum and maximum damage each of the initial Pokémon can inflict, with their signature moves, against a neutral target. It can be seen that Charizard is actually the Pokémon that causes the least amount of damage, while Venusaur can deal the greatest amount of damage. Thus, Venusaur can be regarded as the “most potent” starter if we are referring to the sheer amount of damage caused. The present study thus shows that Codd’s (2016) analysis is not applicable to the game itself, since it is not based on the variables and values present in the game mechanics. Also, as shown above, Venusaur and not Charizard is the “most potent” starter considering just the raw amount of damage it can cause. However, this is true only for a single attack in a single round of battle (which is important for the so-called “one-hit knockout”). Of course, as every player knows, one should not think that damage output alone makes a Pokémon more effective in battle. The game has much greater complexity and we would be reducing it to nothing if we just consider maximum damage. For instance, Solar Beam is a move that needs to spend 1 turn of the battle recharging, while both Flamethrower and Hydro Pump can be used every round. Furthermore, there are other factors, like Hydro Pump having an accuracy of 80% (meaning it misses one out of every five times) and Flamethrower being able to leave the defending Pokémon with the burn status condition. However, this is a matter for another day; for now, Charizard has lost its crown. Figure 7. Simple chart showing the maximum (red) and minimum (blue) points of damage each of the starters can inflict with their signature moves (Solar Beam for Venusaur, Flamethrower for Charizard, and Hydro Pump for Blastoise). The chart takes into account the values obtained by both the Pokémon Showdown and the Pokémon Damage Calculator. Bulbapedia. (2016) The Community-driven Pokémon Encyclopedia. Available from: http://bulbapedia.bulbagarden.net/wiki/Main_Page (Date of access: 08/May/2016). Carli, B.L. (2016) Pokémon Damage Calculator, version 1.0.0. Available from: https://build.phonegap.com/apps/1824036/install (Date of access: 23/Apr/2016). Codd, T. (2016) Which is the most offensively powerful starter Pokémon? Journal of Interdisciplinary Science Topics: https://physics.le.ac.uk/jist/index.php/JIST/article/view/153/94 Date of access: 23/Apr/2016). Pokémon Company. (2016) Pokémon 20th Anniversary. Available from: http://www.pokemon20.com/en-us/ Date of access: 23/Apr/2016). Pokémon Showdown. (2016) Pokémon Showdown! BETA. Available from: https://pokemonshowdown.com/damagecalc/ (Date of access: 23/Apr/2016). Serebii.net. (2016) Serebii.net – Where Legends Come to Life. Available from: http://www.serebii.net/index2.shtml (Date of access: 23/Apr/2016). Smogon University. (2016) Competitive Pokémon Community. Available from: http://www.smogon.com/ (Date of access: 23/Apr/2016). Vianna Sym, Y. (2015) A Arte do Pokémon Competitivo. 2 ed. Available from: http://1.pokeevo.net/topic/8946178/1/ (Date of access: 23/Apr/2016). Wikipedia. (2016) Pokémon. Available from: https://en.wikipedia.org/wiki/Pok%C3%A9mon (Date of access: 23/Apr/2016). Next Post Is the Great Attractor a Tengen Toppa Gurren Lagann?